One of the key sources we have relating to Waddesdon during Baron Ferdinand's time is Waddesdon's Red Book. The Red Book is an album of photographs along with a short essay by Ferdinand on the process of creating Waddesdon. From the dedication it seems likely that Ferdinand had the album printed as presents for his friends and family. We know of two further copies in other collections, only one of which is bound in red leather, but do not know how many there originally were. The photographs used to illustrate the Red Book give us a fascinating record of the way Ferdinand furnished his house. They show the location of everything from paintings and furniture to carpets and porcelain. Many of these items are still in the collection today and we have used the images of the Baron’s Sitting Room to recreate the interior as it was then. Other photographs show the layout of rooms in the Bachelors’ Wing before it was reorganised following the removal of the items from Ferdinand’s Renaissance collection that he bequeathed to the British Museum. 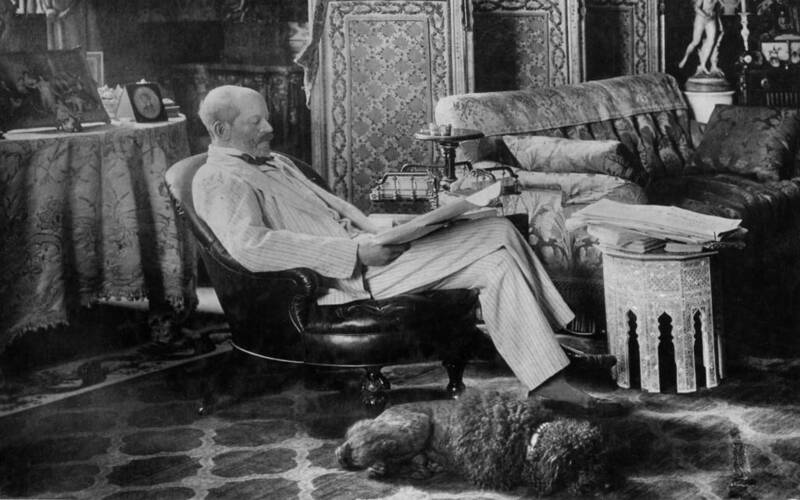 Baron Ferdinand de Rothschild in his private sitting room. © National Trust, Waddesdon Manor. The creation of the gardens and landscaping of the estate involved almost as much work including the removal of huge amounts of soil to level the incline on the carriage drives and roadways. It must have been an amazing sight to see the plants and trees transported to Waddesdon to cover the the once bare hillside:”Percheron mares…were employed principally in connection with the cartage of large trees which were brought from all parts of the neighbourhood, and for the moving of which on to the highways the telegraph wires had to be temporarily displaced.” The information Ferdinand gives about the creation of Waddesdon gives us an indication of just how much effort it took to create his masterpiece, not just the process of building the house but also of building up a unified and consolidated estate through the purchase of land from neighbouring landowners. As he makes clear in one story about the purchase of land from a particularly stubborn farmer he was not beyond a bit of gentle manipulation when necessary. 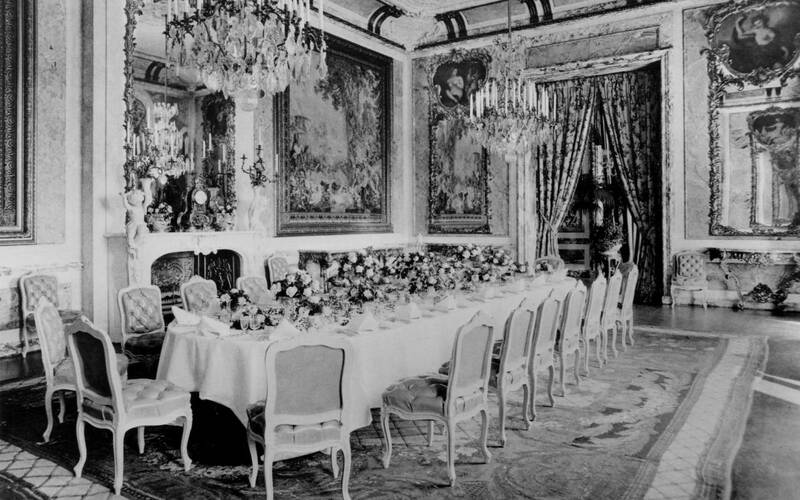 Dining Room in The Red Book, 1897 © National Trust, Waddesdon Manor. Thankfully, his fears proved groundless, and Waddesdon continues to thrive!